I am so caught up with Thanksgiving I have not been able to take many pictures though, sorry. We are having these hot rolls tonight with a pork roast dinner, so picture taking was easy. Place water in a large bowl or your Kitchen Aid Mixer bowl, this is what I use. I love my Kitchen Aid mixer! Sprinkle yeast on top of water. Should foam up in 5 minutes. If it does not, your yeast may not be good. Once foaming adds sugar, eggs, salt, and butter. Mix for 3 minutes. Once that is mixed add flour 1 cup at time until well incorporated. Knead for 5 minutes. 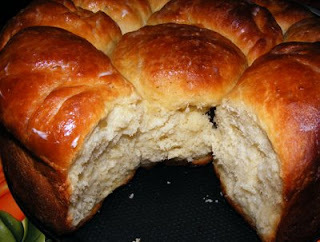 Brush bread dough with butter and cover for 1 hour or until it is doubled in size. I place mine on top of my stove to rise. Once raised, butter your baking pan. Break dough into 3-inch balls and roll in your hand until smooth. This dough is a little sticky, so add a little flour to your hands. Put into pan and brush each roll with melted butter. Cover with plastic wrap and let double in size, this usually will happen in 1 hour. Uncover and bake at 400’ for 35- 40 minutes and they are golden brown. These are soo good and easy but they don’t look easy when served. Now get baking!! Your dinner rolls or biscuits, dinner rolls or biscuits, decisions, decisions, so much doughy goodness, so little time -- thank you!